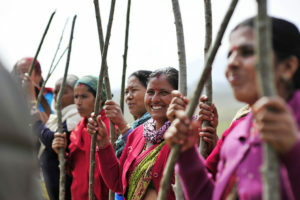 Realizing local and global benefits from community-based forestry in Nepal. Nepal is a country of vast extremes, from lowlands and forested plains to mountain ranges, and, of course, the iconic Mount Everest. With land altitude varying from as low as 70 meters to more than 8,800 meters above sea level, this small landlocked nation has the most dramatic elevation extremes in the world. Within these vastly differing landscapes lie unique ecosystems. 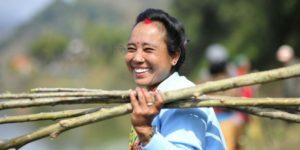 For the past four decades, Nepal has been on the leading edge of Community-Based Forestry (CBF), with 40 percent of the country’s 28 million people working to manage and help restore nearly a third of the country’s forested land. 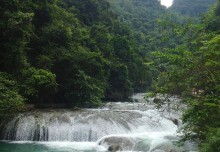 These forests provide a wide range of ecosystem goods and services to local communities including clean water, timber and firewood; as well as services like water purification and regulation; air regulation; biodiversity maintenance; seed dispersal; and greenhouse gas mitigation and flood control. In the past, most of the research around CBF has been focused on how reforested areas can provide goods to help local communities. Yet little research has been done on the effects and benefits of ecosystem services (ES). ES covers four basic services: 1) Photosynthesis support 2) Provisioning (i.e. wood, food and water) 3) Regulation (i.e. climate change and water quality); and 4) Cultural services (i.e. ecotourism). In a recent study, researchers, including FTA scientists, from the Center for International Forestry Research (CIFOR) and partner institutions, looked at how these services affect CBF and how this can have a positive impact within Nepal and around the world. “Nepal has had many successes using the CBF approach with more than 30,000 community groups mostly in the mid-mountain region,” said the study’s co-author Kiran Paudyal, a PhD Candidate at the University of Melbourne. “But while the country has recognized the potential of ES in poverty reduction, there is no practical plan at the moment to make it happen,” he added. The researchers found that current policies and regulations are not flexible enough to allow for innovation. Instead, they focus on a narrow, subsistence approach with government decisions exclusively focused on timber and firewood production, a few forest products, and biodiversity conservation aimed solely at ensuring the protection of trees. “There needs to be a focus not only on tangible goods, but on services that are intangible like carbon and water management. For example, a community may have rights to a tree, but it is unclear if they can sell the carbon credits from the tree,” said Paudyal. What’s more, there needs to be some sort of compensation for the work people do to protect these ecosystems. 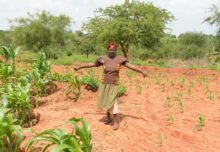 One solution is Payments for Ecosystem Services (PES), which are incentives offered to communities in exchange for managing the land that provides ecosystem services. However, research has shown that in Nepal, as well as in a host of other countries, land tenure and ownership rights are making this type of compensation nearly impossible. Paudyal said that an overarching ES approach could provide new opportunities for securing local tenure rights. “What Nepal needs is a broader national policy and plan for tenure reform with improved local rights and capacity for rule enforcement, monitoring, and sanctions to ensure the sustainability of the approach,” said Paudyal. This plan could be part of a national ES strategy that promotes international investment in ES management, builds the technical capacity of stakeholders, provides a legal framework, and harmonizes existing policies. “The strategy should also recognize the role that communities play in managing Nepal’s natural resources and how ES, when correctly implemented, can contribute to reducing poverty and improve the economic well-being of these communities,” said Paudyal. The researchers also found that for the ecosystem services approach to work, they need to be mainstreamed into existing forestry related legislation, as well as National Parks and Wildlife laws. In addition, intermediary organizations, the private sector, and certification agencies all need to be established and strengthened. 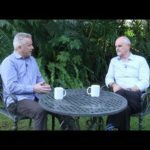 Paudyal said that because ES is still in its early stages, there needs to be more awareness of the benefits of ES among government, private sector and communities alike. In addition, the study shows that more training and the development of an ES knowledge bank alongside a network of experts from donor agencies, government, NGOs and civil society will help ensure success. This will, in turn, support the future development of government policies that support communities. 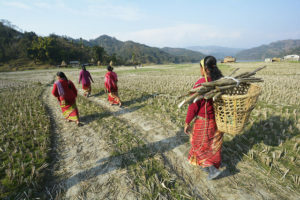 Nepal has made considerable advances since the 1970s when forests were decentralized and the idea of community forestry rose in popularity due to the sense of crisis and environmental awareness growing globally. 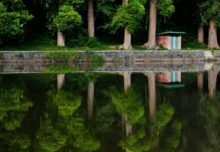 Now, ecosystem services are also on the rise. “Ecosystem services such as timber production, firewood, and fresh water are declining in much of the world, but in Nepal, it is has actually increased in CBF regimes,” said Paudyal. 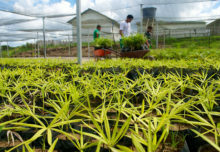 Pauydal said the research showed that this was largely due to the efforts of local people to convert degraded agricultural land and grasslands to forests. This in turn, improved water catchment values and the quality of water for irrigation and hydro-power. “Nepal has made a good start. But we really need to understand the multiple benefits of ES in these communities. We don’t really know the full impact that ES can have on people,” said Paudyal. As the study concludes, the trade-off between the growing need for wood and food and life-sustaining services is complex and further research is needed to systematically assess the supply, delivery, and values of services that come from these diverse ecosystems. 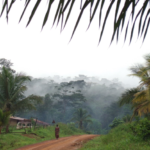 By Suzanna Dayne, originally published at CIFOR’s Forests News. For more information on this topic, please contact Kiran Paudyal at kpaudyal@student.unimelb.edu.au or Himlal Biral at h.baral@cgiar.org.